This second edition of Using Mind Maps Magazine opens with an article by Paul Foreman on why visual thinking works. Now, the interesting fact about Paul, is that he uses Pen and Paper to produce his Mind Maps. They are Hand Drawn and then digitized afterwards. Strangely, the iPad is an ideal medium for his hand drawn Mind Maps, as the user can ‘Pinch and Zoom’ the image. The iPad makes it very easy to then navigate the zoomed in image without losing clarity. I am therefore very happy to have him on board. I am sure that there will be many more Mind Maps shared by him in the future. But the Mind Map is only the beginning! His insights on Visual Thinking are brilliant. So, if you’ve been largely a linear thinker, or only flirted with visual thinking, have a look at Paul’s Article on Visual Thinking in the Magazine. Chuck Frey, is well-known in the Mind Mapping World for his Mind Mapping Software Blog. His insightful articles and examples of using Mind Mapping Software will give you everything you need to know about using Mind Map Software. 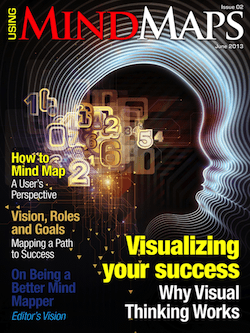 (It’s kind of ironic that I have both the leading hand-drawn Mind Mapper and the Leading Mind Mapping Software guru featured in the same magazine). But, it’s not one or the other. I use both hand drawn Mind Maps as well as Mind Map Software. I think the iPad gives a third option, as it is a hybrid between Mind Map Software and Hand Drawn Mind Maps. Chuck speaks about reaching Escape Velocity on your dreams, together with a Mind Map Template for you to use. Adam Sicinski has two articles as well as a video. The iPad Magazine is a great medium to use multimedia components, but still have the magazine experience. Adam uses an interesting model, the GROW model, which is used by Life Coaches to help you reach your potential. He has a unique style of Mind Mapping and the iPad is perfect for navigating and exploring his Mind Maps. His second article on Mind Mapping Your Career Path is the second of a three part series. He uses video to talk through the process and also includes a text summary. I’ve also included an article by Andrew Nesbitt (Nez). He contributes to the great Internet Marketing membership site, ImmediateEdge.com. He produces two ‘How to’ videos and articles on using Mind Maps in one of their courses. I’ve asked to include them in the Magazine and he was kind enough to allow me to do that. I wanted his contribution, as it is that of a ‘user’ and not that of a Leading Mind Mapping Expert. The first article covers pen and paper and the second covers Mind Mapping Software. I then cam across the ideas of Nick Duffill after chatting to Liam Hughes of BiggerPlate. I’ve included a Video and a Mind Map on Communicating using ‘Small Mind Maps’. It is a great idea for communicating with Non-Mind Mappers. I’ve also included two of my own articles in the magazine. The first is on Roles and Goals, with an accompanying Mind Map Summary and the second is on creating a Mind Map Business Plan, with an accompanying Mind Map Template. All in all, I think it is a bumper-filled edition and hope that you well get as much joy out of it as I did creating it!